A man on twitter decided to ask the internet a simple question. "Would you date me". He decided to do it as a twitter poll, so that he could see the stats. Not being the kind of guy who leaves it to chance, he only gave twitter the options of "yes" or "yes". He was retweeted over 100,000 times, and over 68,154 people liked his tweet. With those kinds of stats, millions of people will have seen his poll. Out of that many people, how many would you guess said "yes" or "yes"? He's a good looking guy, plenty of interesting tweets, surely at least a thousand people said yes? No. Out of all the millions of people who saw it and the hundred thousand people who retweeted it, not a single person clicked yes. His friends were less than kind about the final result. 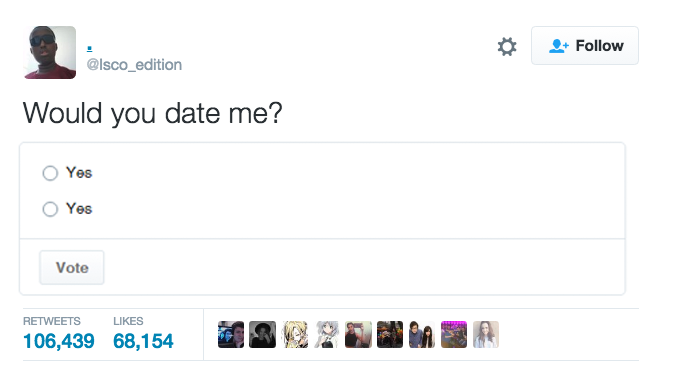 He asked the internet who wanted to date him, and collectively the whole internet decided to make sure everybody saw the question but nobody would say yes to it. Not one single person. Fortunately the guy who absolutely nobody wants to date saw the funny side of it. Even if it has left him a bit gobsmacked. And he seems to have taken aboard advice for future polls. So next time you get rejected at the union, remember this guy, who got rejected by a million people all at once and was basically fine about it. Puts things in perspective, doesn't it?